It is time to celebrate the arrival of spring, the beginning of a new year. 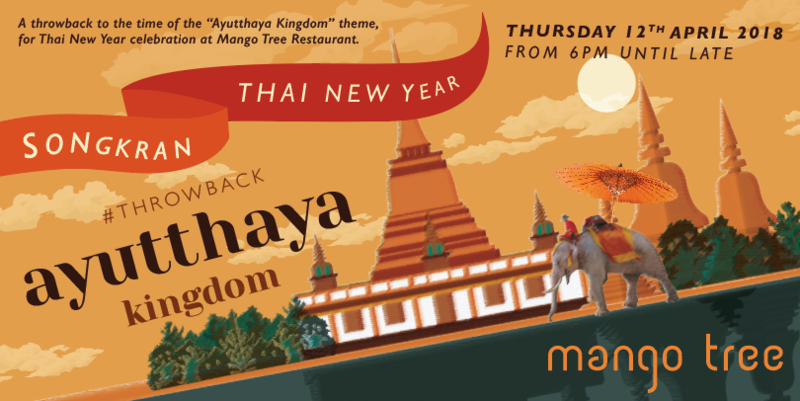 This year Mango Tree has the “Ayutthaya Kingdom” as our Thai New Year festival theme. Ayutthaya Kingdom was known as one of the most wealthy and powerful Thai empires, which had a rich Thai culture in food and festivals. Thais believe that festival celebration has always been a precious time for them to gather with family and friends, especially in New Year celebration as it brings lots of joy and good luck to everyone. Let’s get ready and throwback to the time at one of the prosperity empires out of the many in the World. Enjoy and experience the most exclusive Thai New Year celebration along with Thai traditional ritual, classical Thai performances, traditional Thai set menu and DJ till late. You will be offered a welcome drink on arrival by our lovely staffs that dressed in traditional Thai clothing. We will guarantee you to have an unforgettable night at Mango Tree. £55 per person includes Mango Tree welcome drink on arrival, Thai traditional three course set menu, Thai classical performances, DJ until late and much more funs! In the past years, tickets of this event sell like hot cakes, so do not hesitate to get your online ticket here.